Custom Pen and Pencil Cases -Holders Personalized in Bulk or Blank. Promotional, Very Inexpensive. Budget Prices in America. 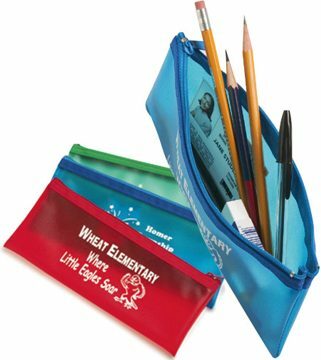 Bulk pen and pencil cases (holders), personalized with your custom imprint. Lowest prices in the USA and Canada for wholesale personalized pen and pencil holders. Free artwork design. American clients pay no taxes. We will send you a proof for your approval before production. We also supply blank (not custom imprinted) bulk pen and pencil holders for $1.05 each (minimum quantity: 200). Prices include your 1-color custom imprint. We also supply blank (not custom imprinted) bulk pen and pencil holders for $1.05 each (minimum quantity: 200). SETUP CHARGE: $38.00 per order. SECOND SIDE IMPRINT: Add $0.15 to the unit cost, plus another Setup Charge of $38.00. PRODUCTION TIME: 10 days after art approval. Rush production is available: contact us. Blank (not custom imprinted) pen pencil holders ship next day. Colors: Frosted Vinyl in Cherry, Aqua, Sea Gren (see picture). Assortment is Allowed.